The aim of organisational structures is collect together and reflect the hierarchies and dependencies amongst employees that exist in a company. Permissions are granted to these structures as usual via the ribbon. Further information on this subject can be found in the section “Permissions for organisational structures”. As a specific authorization concept is generally already used within organisational structures, this is also used as the basis for further permissions. 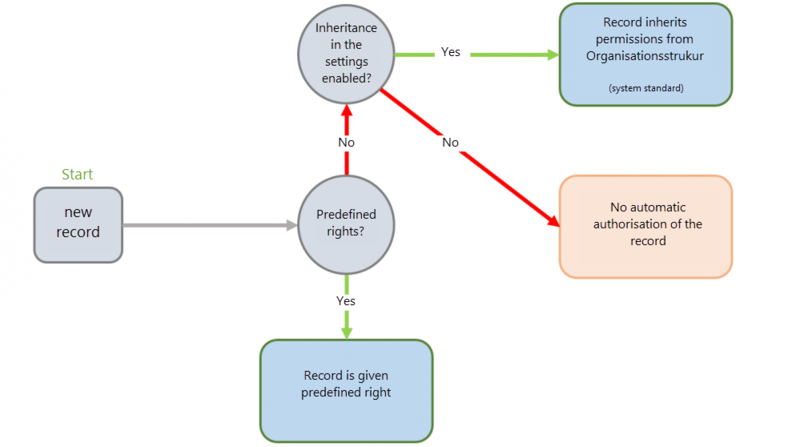 This form of inheritance is technically equivalent to granting rights based on affiliations to a folder. When creating a new record, the record receives the permissions in accordance with the defined permissions for the organisational unit. Whether this form of inheritance should be applied is defined via the settings in the ribbon. It can be configured in more detail using two settings. This setting is relevant for newly created records. Organisational unit: When creating new objects, permissions are set in accordance with the defined rights for the target organisational unit. This setting is active by default. Organisational unit and user: As well as inheriting permissions for organisation units, the configured permissions for the user are now also inherited when creating private records. *If inheritance for the users is also activated, the creation of private records is in itself no longer possible. When creating new records to be saved in the organisational unit for the logged-in user, the permissions for the record are now granted in accordance with the permissions for the user. Increase or reduce permissions: The permissions for the passwords are retained and are only increased or reduced by the change. Overwrite permissions: The permissions for the passwords are completely overwritten. This means that all permissions for a password are firstly removed and then the new permissions for the organisational unit are inherited. Cancel inheritance: The permissions are not inherited but are only changed in the organisational unit. *The permissions are only inherited by existing passwords within the organisational unit. Therefore, the permissions are not inherited downwards throughout the entire structure. This example shows the creation of a new record in the organisational structure “marketing”. It is defined in the settings for the stated organisational structure that permissions should be inherited by new objects in accordance with the organisational structure. A new password is now created in the organisational unit “marketing”. It is important that no preset is defined for this organisational unit. The permissions for the record just created are now shown.